My first child was a moderately traumatic birth; there are plenty of truly worse birth stories, but this one left me with a lot of pain and dysfunction in my body for awhile, and I was not looking forward to the second one. Nor was I looking forward to spending days at the hospital, in hospital gowns and mesh undies feeling something between helplessness, exhaustion, and plain old non-yourself-ness. 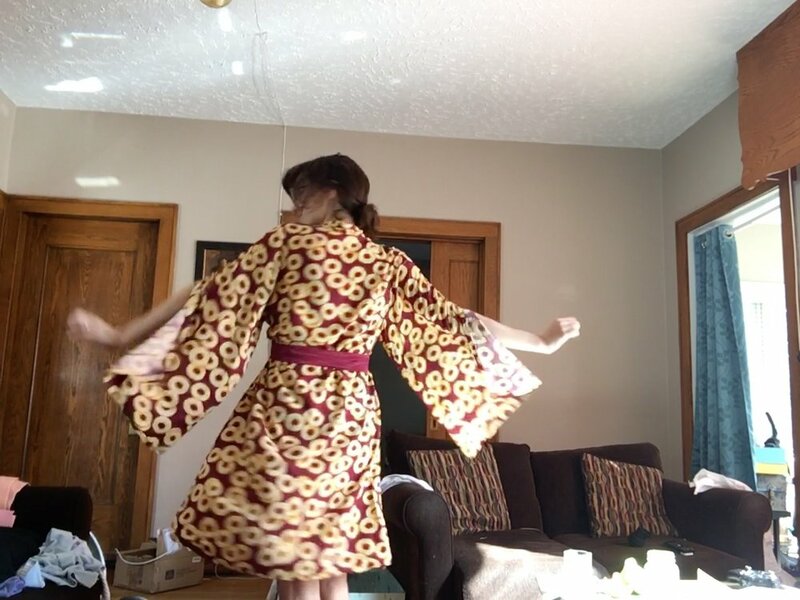 So I decided to make a robe. A flowy, too-much one, in something light and airy to keep my temperature regulation at bay. Soft and fancy to feel like myself. Ideally in a dark print to disguise any sweat etc. And just sensible enough to actually make sense in a hospital, feeding a newborn. When I saw Debbie of Lily Sage & Co’s pink silk Asaka, I knew it could be perfect. I also toyed around with going the opposite direction, zero-waste, but ultimately decided that large, flowy sleeves with a giant slit were the treat I emotionally wanted and needed. Plus, truly making a zero-waste pattern work would mean probably piecing a bolt to achieve the right dimensions, and I really wanted to make this a silly print. Then, I finally got to make my first order from Matchpoint Fabric. I love this store so much, and am so proud of Michelle (in that way one can be “proud of” someone they don’t actually know for doing something one had no hand in making happen) for bringing thoughtful minimal-eco-impact reorderable fabrics and beautiful deadstocks to a Canadian market. I have only not ordered before because I try to stick to buying only for immediate plans, and even then I’ve started to build up a stash. But then Michelle brought in a beautiful, silly, (deadstock!) pineapple-slice rayon challis, and i knew my robe was ready to happen. I bought 5 yards of fabric, hoping that it would give me some room to lengthen the robe as Debbie had for hers. I immediately washed the challis and draped myself in it upon arrival. I only ended up adding 4 3/4 inches, in part because that was the length of the copyshop page below the pattern so seemed like as good a place as any to start, and in part because that ended up being nearly as much as I could squeeze out, and in part because it looked like a nice length. Serendipity. Asaka is a fabric-eater. I’m ok with that. The project was slow-going, because of pregnancy. I got a lovely pinched nerve in my elbow when I was hoping to get started, so I couldn’t even hold a rotary cutter in my dominant hand. My husband cut the fabric out for me, with me helping to iron and lay out pattern pieces to maximize what we could get out of it. He rules. I took my time - tried out a spray starch, which I’m not sure helped much, but smelled lovely. Staystitched everything except bottom hems. Didn’t push on getting much done in any given sitting. Sewing this up was pretty smooth at this relaxed, careful pace, and very rewarding. I did, however, do the worst french seam of my brief sewing career and forget to add inseam pockets (I’d thought about one). That seam happened because I sewed, pressed, and trimmed the first step of the French seam right sides together first. I was not willing to compromise on my beautiful seams but it was a side seam, and thus there was no way to recut. Instead, I carefully unpicked (tho not carefully enough... I tore a lil hole in the fabric too, but within seam allowance) the seam then used my staystitching as a seam allowance guide to redo the french seam in its entirety, moving to a 1/8 then 1/4 split. It worked! Last detail: I decided that pineapple-on-pineapple wasn’t the way to go for the belt, so I went to Century Fabrics in town to find something suitable. I came out with a 20cm remnant of a polyester satin-backed crepe that really was a great match for the burgundy background of the pineapples. I’m not keen on polyester in general, but for a belt, and using up a remnant, it felt quite right. If there is a next time: In seam pockets!! Would love to make this in a simpler fabric as well, a la Lily Sage. Always be careful with french seam order! And keep staystitching, that was smart.